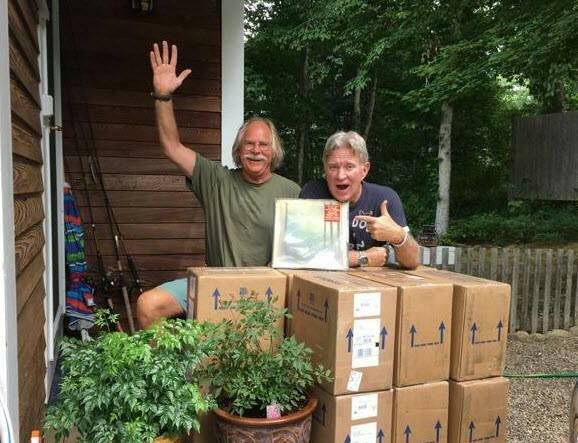 When word got around a year or so back that Will Luckey of West Tisbury and Tim Goodman of Vineyard Haven were collaborating on an album, those who first heard the singer/guitar pickers play on the Vineyard in the 1960s might have felt a bit nostalgic. Once they give a listen to what the two old pals have been up to recently, their focus will likely shift to the present, and maybe to the future too. Friday, August 19, is the official release date of “Magic Music,” a CD and plain old vinyl LP that reintroduces us to the folk/rock/country music that they cut their teeth on, while refreshing it with the help of some incredibly accomplished musicians and modern recording techniques. For anyone who likes good, honest acoustic music, it’s a happy reminder that the style still cuts it and, better yet, that it has endured. At another time and place, Luckey and Goodman might have gone quietly through their teenage years, done the requisite time at college, and taken up predictable, traditional careers. But the mid-1960s were not just any old other time, and the Vineyard, where they summered, was alive with music, from up-Island barns and beaches to coffee houses in Oak Bluffs. With another summer kid, Bill Makepeace, they made music around the Island until September rolled around and they had to re-shackle themselves to the deadening life of prep school. Like a lot of their contemporaries at the time, the lure of the alternative was irresistible — especially if it meant taking to the road and making music. Besides, with last names like Goodman, Luckey, and Makepeace, why wouldn’t they think the stars had lined up for them? After a final brief stab at respectability, Luckey ended up living in a school bus in a canyon near Boulder, Colo., with a ragged collection of shaggy peers who were determined to live life the way it appeared to them every morning. Their lifestyle was considered revolutionary by many, aberrant by some, and different by almost everyone, but they made it work for them, doing what they had to to survive, and making music — because they loved to. With Luckey at its hub, a band coalesced, at first only playing at parties and busking on the campus at the University of Colorado. Players came and went over time, but the core remained — Will Luckey, George “Tode” Cahill, and Chris “Spoons” Daniels. They called themselves Magic Music. Magic Music recording at EastWest Studios in Los Angeles in November 2014. From left, Tim Goodman, Tommy Major, George Cahill, Chris Daniels, Jimmy Haslip, Will Luckey, Bill Payne, and Scarlet Rivera. —Tara Quinn. They played around the country for a few years, on their own and opening for well-known, large-venue acts like Cat Stevens, the Nitty Gritty Dirt Band, and the Youngbloods. They were hustled by a couple of major record companies, but Luckey, idealistic and suspicious of The Man, didn’t like the terms. So the band stuck to its roots, building a wide following in Colorado but never raking in the big bucks. It disbanded in 1976, as family-building and making a living intervened. Some of the players continued on in music, part or full time. Daniels toured with the likes of Al Kooper and David Bromberg before forming Chris Daniels & the Kings, who have put out 16 albums and toured extensively since the mid-1980s. Luckey moved back to Martha’s Vineyard in 1980, making music with his band Lucky Strike when he could, shingling when he couldn’t. After a nasty fall from a ladder compromised his guitar picking, he went to Berklee College of Music, and then returned to the Island to teach piano and guitar to kids from 6 to 60. Goodman, meanwhile, pursued a solo career as a folk/country artist, eventually settling in Los Angeles, where he worked as a studio musician and in 1983 co-founded Southern Pacific, a country rock band that made five albums and had several hit songs, including the chart-topping “Anyway the Wind Blows.” After leaving the band in the late ‘80s, he ran a charter boat in Cabo San Lucas for many years before returning to the Vineyard full time in 1999. Though their musical paths diverged, Luckey and Goodman stayed in touch over the years, and they stayed true to their devotion to sweet-sounding vocal compositions that have been compared to the Eagles, in Goodman’s case, and Crosby, Stills, and Nash in Luckey’s. The lasting imprint of the music they first loved as teenagers resurfaced a few years ago when Luckey, Goodman, Cahill, Daniels, and Makepeace reunited at the 60th birthday party of Charley Finnerty of Chilmark, who played a bit of harp with them back when. Next came a concert and a recording session in Boulder, where the idea for an album was conceived. In addition to playing and arranging, Goodman took up the role of producer, and the project slowly developed momentum. As it gained steam, four ringers were added to the lineup: Grammy-winning bassist Jimmy Haslip, drummer Tommy Major, who’s worked with the likes of Chuck Berry and Blood, Sweat, and Tears; violinist Scarlet Rivera, best known as part of Bob Dylan’s Rolling Thunder Review, and Bill Payne, who has played with Little Feat and Elton John. Attracted to the music and players, not the money, they helped round out a sound that is as professional as it is pleasing. Goodman enlisted accomplished sound engineers, and recorded at top studios like EastWest in L.A. It’s no mean feat reprising tried and true oldies through a contemporary sensibility, and Goodman made sure to use top talent to pull it off. Together, this gang has hit the bull’s-eye. “We wanted to shed a light on a great body of work that nobody ever heard, and spread a positive message that was viable then and I think is viable now,” Goodman continued. To accomplish that, top-notch marketing and promotion veterans were recruited, people who have worked with an impressive cast of well-known musicians over the years. “We’re too old,” Luckey and Goodman said independently about touring to support the album. Instead, they will rely on radio and playing at festivals to spread their wealth. Last week, the band met up in Boulder to introduce Magic Music to a convention of radio programmers, and currently it’s WMVY’s album of the month.